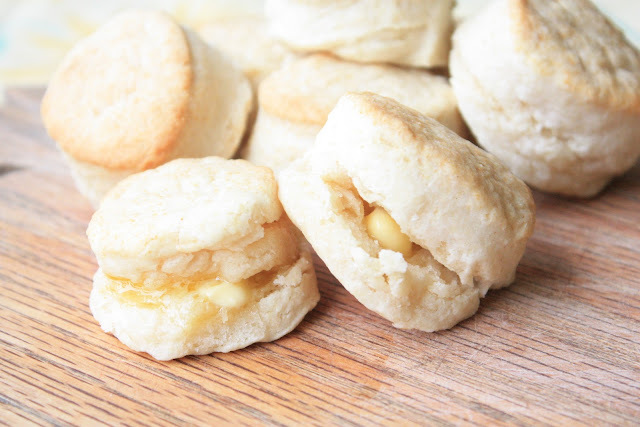 Yep, you read correctly, homemade biscuits using only two ingredients! All you need is cream and self-rising flour. The fat is in the cream, and the self-rising flour provides the salt and leavening. It can't get much easier than this! 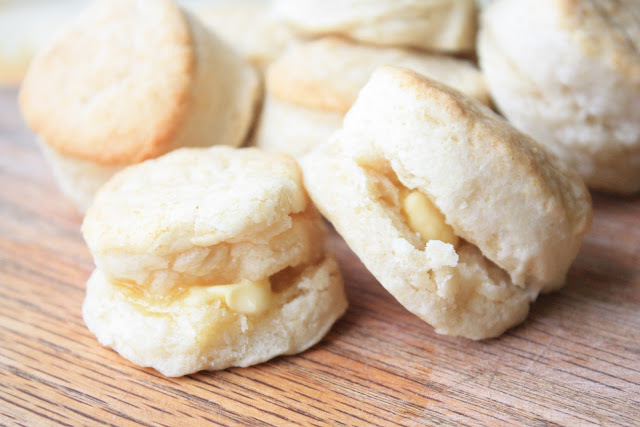 These biscuits were so much better than the baking mix in a box version, but just as easy! After combining the 2 ingredients and stirring until blended, roll dough on a lightly floured surface and knead 10 times. Roll to 1/2- inch thickness. 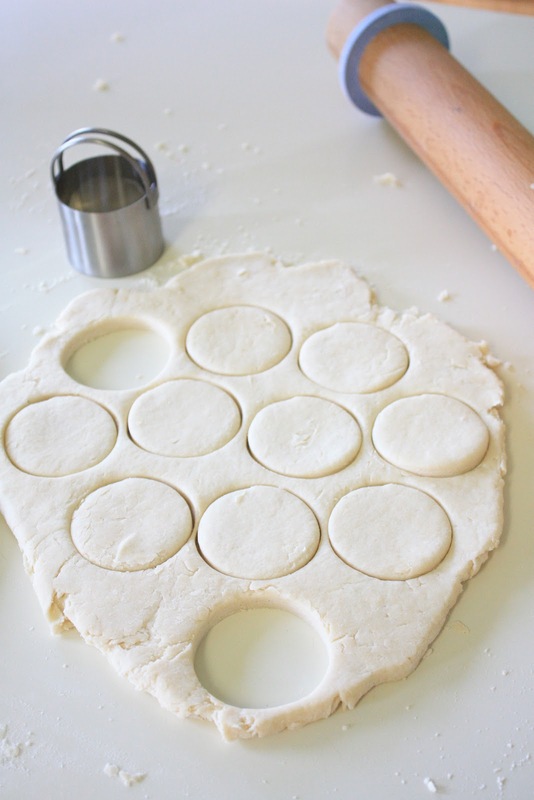 Place biscuits close together on a lightly greased (no greasing necessary on my stoneware!) baking sheet. Bake 10 minutes until golden brown. Add butter and ENJOY! We sure did! Preheat oven to 450 degreesF. Combine flour and cream in a mixing bowl, stirring just until blended. (The dough will be a little stiff.) Transfer dough to a lightly floured surface and knead 10 times. Roll to 1/2-inch thickness and cut with a 2-inch cutter. 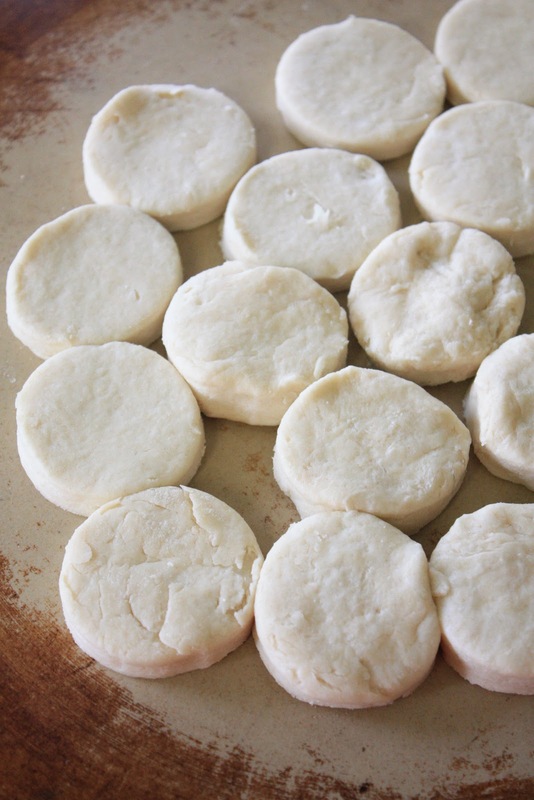 Place biscuits close together on a lightly greased baking sheet. Bake 10 minutes. Makes 12 biscuits. What a fantastic recipe. Just when you think things can't get any easier, it does. The biscuits look perfect. These just made me smile. I have been craving biscuits for days. I'll be making these tonight for sure! Can you believe I've been looking for a quick easy biscuit recipe? Of course you can! Could this recipe be used for drop biscuits. Yep that's me, trying to take a shortcut on your already super simple biscuits! Serious? Only 2 ingredients? That just doesn't even seem possible. How cool is that!!! You can bet we'll be making these! Thanks!!! In Australia we call these "scones" and eat them with butter and jam or jam and cream. I have a similar recipe just with a couple more ingredients! This one is so simple and they do look tender and light! I love it that these are so simple to make! I've never made biscuits at home before ... I'd love to try this one ... such a simple recipe and the biscuits look great!!! The texture of your biscuits looks heavenly. How easy can it get? I am going to have to try these. I love biscuits, but I am not a fan of dry crumbly ones. These look fantastic. Your leprechaun granola was so cute. Bet everyone loved it. Does everyone at your house know how lucky they are??! A fuss free and delicious recipe! What an unbelievable recipe! I love it when things are easy and delicious. That one's a great find! The easier the better. They look delicious too! Perfect biscuit (especially for a weeknight meal when you want some with supper but you don't feel like messing with lots of ingredients). I love it. Sometimes simple really is better!! Just wanted to drop a not to say that I made your Lemon Shortbread Truffles and posted them today! They were fantastic! I served them for a luncheon and everyone wanted to bring extras home. Thanks. I love fresh hot biscuits with butter and jelly! Yours look so yummy! What beautiful biscuits! That is an art form! 2 ingredient biscuits? You can't get better than that. This recipe is bookmarked! Wow! You weren't lying when you said two ingredients!!! I have seen recipes like this one and have always wondered how they turn out. Your biscuits look perfect, so now I know...can't wait to try it myself. Sue those are perfect looking! I'm hungry. I shouldn't be visiting while my stomach is growling! These look really good! I love homemade biscuits, and I love EASY!! I am hosting a giveaway for the "Baked" cookbook, you should enter! WOuld love to see the twist you could put on their recipes! Sue, thanks for correcting me - I typed that wrong, it was the lemon juice that I did differently, not the zest. I have corrected it on my post. Yum, yum and yum! My married daughter was asking why she didn't get any after she saw my post. Great recipe for a busy mom! Thanks - glad I found your blog through the bake sale. These sound yummy,I love the simplicity! Biscuits are one of my ultimate weaknesses to begin with, let alone a recipe with only 2 ingredients? You're killing me! you can make it four ingredient biscuits and they are just as easy if you don't happen to have self rising flour. Just add a tablespoon of baking powder and a tsp of salt. Can't wait to see how they turn out! I made these tonight using 1-1/2 tsp. baking soda and 1/2 tsp. salt per cup of flour and they turned out great! This will probably be my new go-to recipe for biscuits. Thanks for sharing it! Made these and they are wonderful! So easy and tender. Thank you for the recipe! Thanks for this really easy recipe. I made 20 but all were AOK with a bit reduced oven time. This was first attempt at making these, I'll be sure to make the right number next time. Do you think I could make a huge batch of them and then freeze some precut non bakes biscuits? I use self rising flour and buttermilk to make my biscuits. They always turn out and are gone as soon as I serve them. I made these the other night and they were great! I did notice that the dough seemed alittle crumbly.. is that cause I needed more cream? Gasp! I'm such a sucker for biscuits. I'm so so so so making these. Thank you! Ms Sue do you think i can make the dough then freeze and bake as needed? I am wondering the same thing. Even though they are easy to make, I'd like to make them ahead of time so that I can have one or two whenever I'd like. I've never done it, but it's worth a try! you can freeze at any point- I read the same recipe on another blog and she freezes then bakes an additional 5-10 min. she has frozen them before and after baking and says they turn out fine. This is the way my Grandma taught me to make scones (I'm Australian). So good with jam and cream! Sometimes I replace some of the cream with Sprite for extra sweetness and lift. can u use buttermilk instead of heavy cream? I haven't tried that, but I think it would work out just fine:). You shoul probably use the full fat version. Good luck! Please help, I've made these twice, both times the dough was so crumbly it wouldn't hold together at all, like a ball, unless I got my hands in there and started mashing it (or kneading) but then I was afraid to over mix (knead) so I ended up adding about 3/4 cup more cream. what am I doing wrong? I think they might have come out ok, but wondered if anyone else had this problem. Should I use a pastry cutter to mix it more thoroughly instead of a fork? I think they tasted ok, I was just thinking they were a tad flat. Such a delicious looking truffle! Perfect for Spring...if it ever gets here!